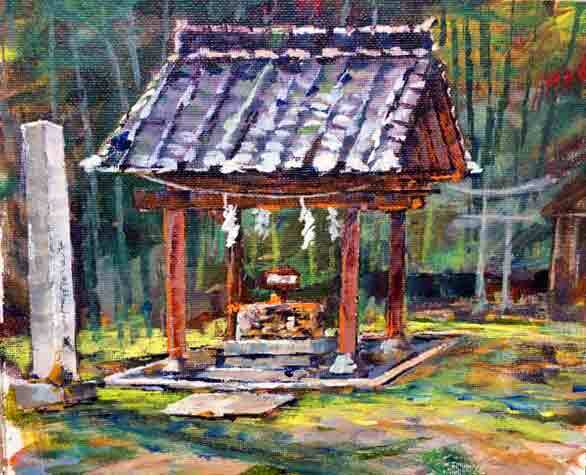 japan – Just Stop and Paint It! 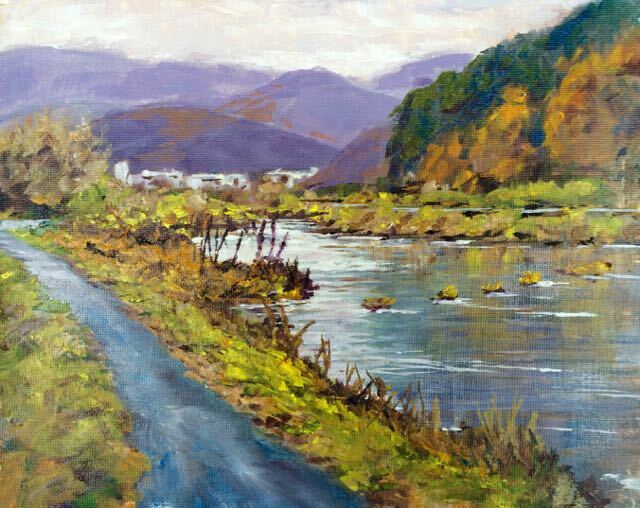 “Kako-no-ike Pond, Korakuen”, 24×12, oil on canvas. One of the Three Great Gardens of Japan is called Korakuen (K?raku-en). Located in Okayama, Japan, it was built in 1700 by Ikeda Tsunamasa. Korakuen means “garden of pleasure after”, which is a reference to a saying attributed to Confucius explaining that a wise ruler must attend to his subjects’ needs first, and only then should he consider his own interests. 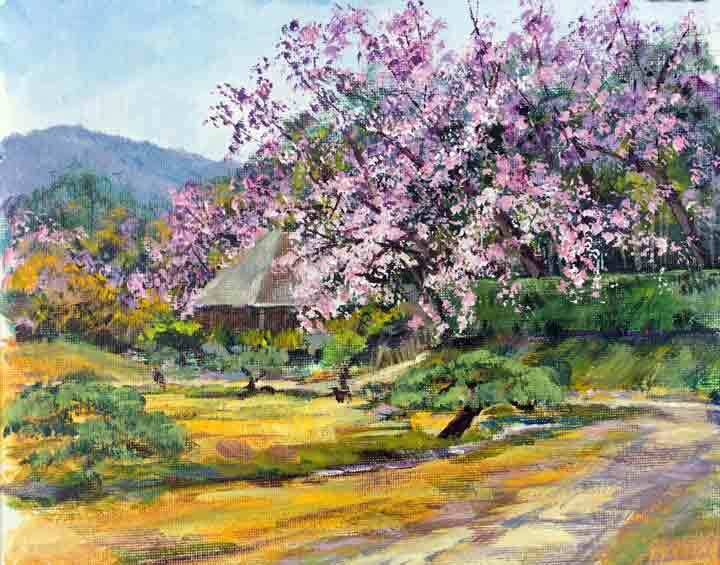 Once a playground for the elite, in 1884 Okayama Prefecture took Korakuen over and opened it to the public. 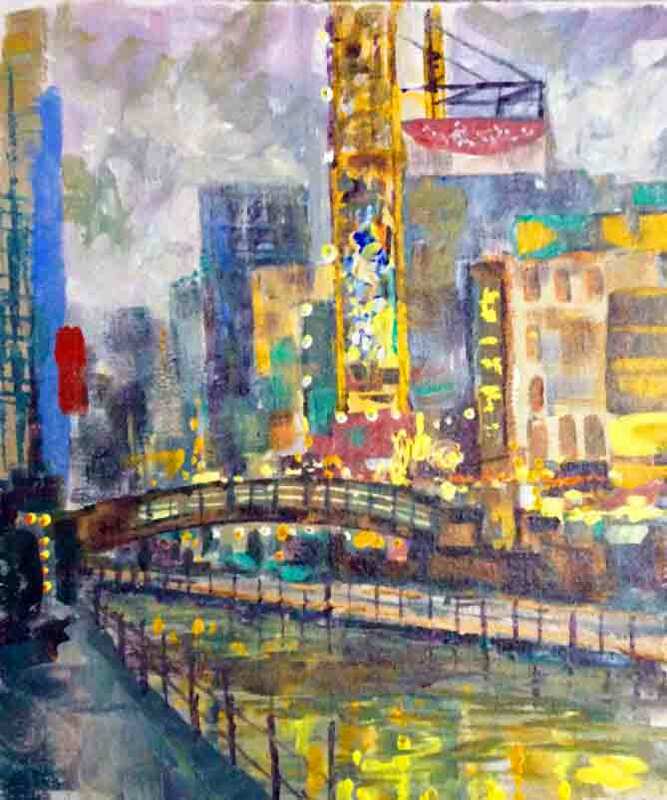 In 1957 Okayama and my home town, San Jose, became sister cities. San Jose built it’s own garden in 1965, called the Japanese Friendship Garden, patterned after Korakuen, and in 1966 it’s koi ponds were stocked with koi sent from Okayama. Although koi live over 50 years with some reports of over 200 years, unfortunately in 2009 a virus wiped out much of the koi in the gardens. 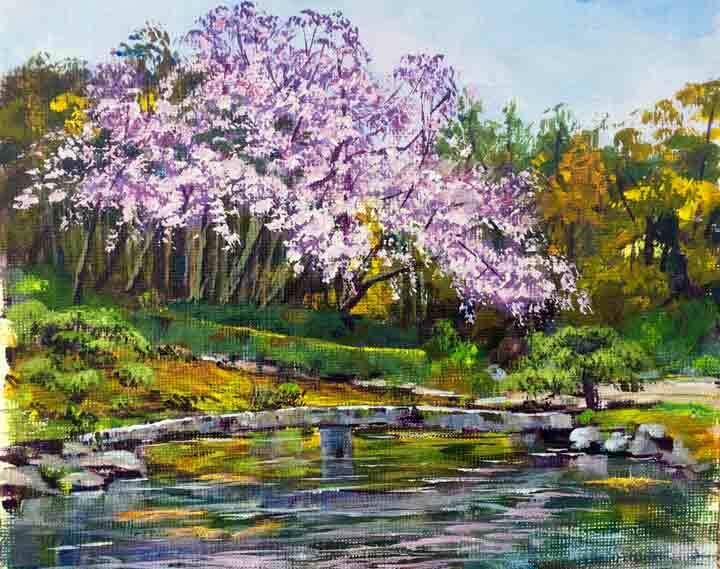 This is a painting of Kako-no-ike, one of the ponds in the garden, and the eighth in my Japan studio series. 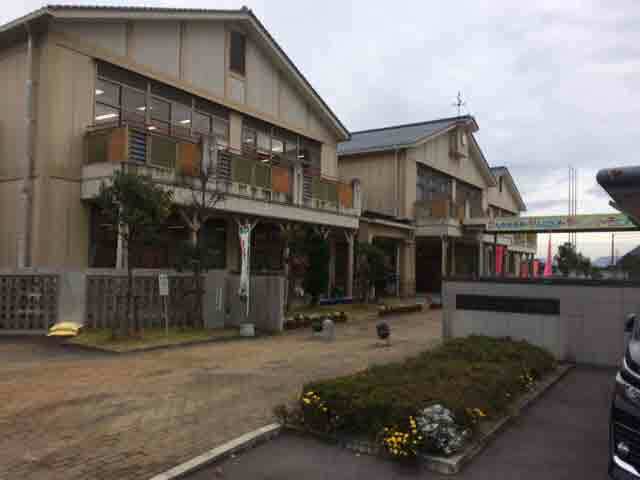 I visited Korakuen January 2015 while visiting my son who has been teaching English to school kids in the area the last three years. 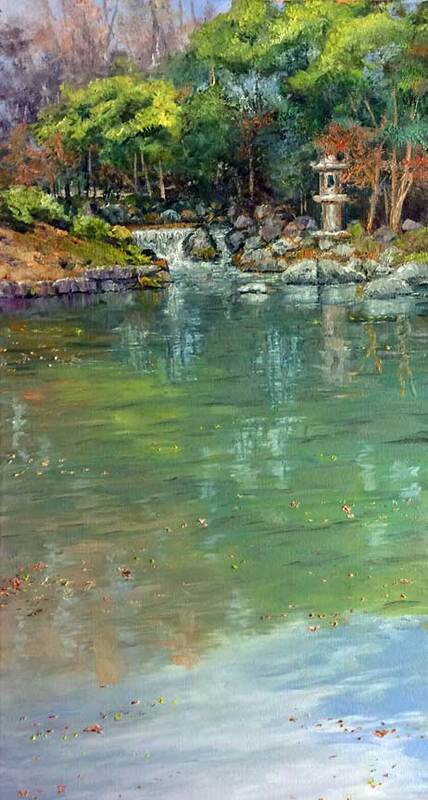 I didn’t have time to do any paintings there, but this is my second studio painting of the garden. 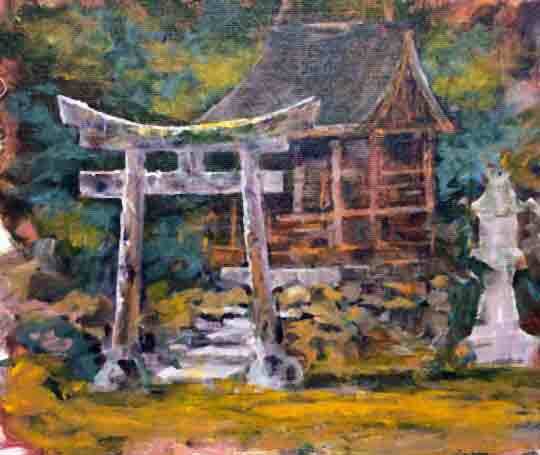 You can see all my Japan paintings, both en plein air (on location), and studio paintings on Pinterest, here. 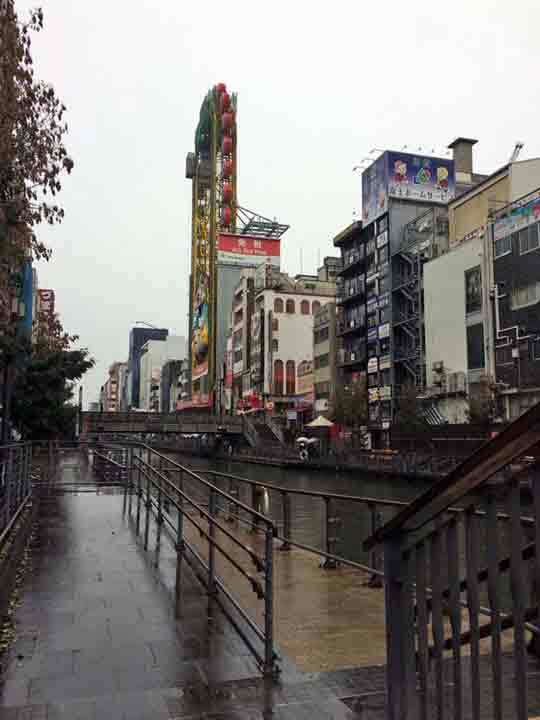 It was a year ago that I spent a few weeks in Japan and Thanksgiving with my son, Justin, who has lived there over three years teaching English to school kids. 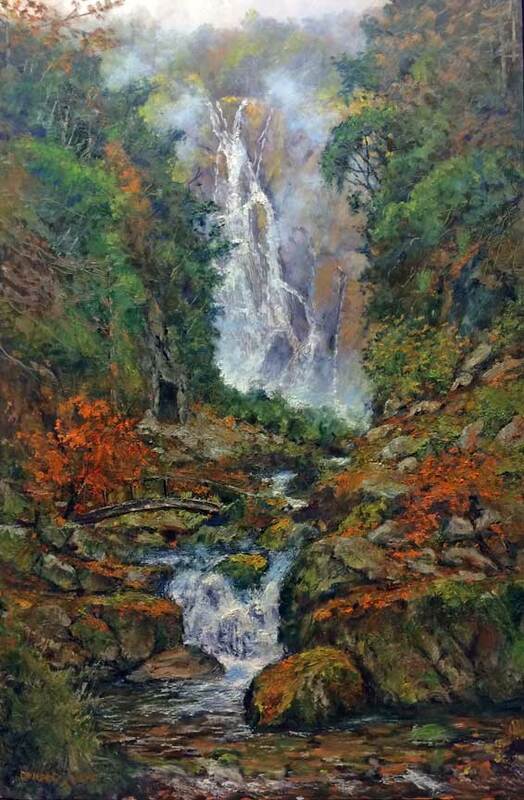 He works and lives in the mountainous town of Maniwa. 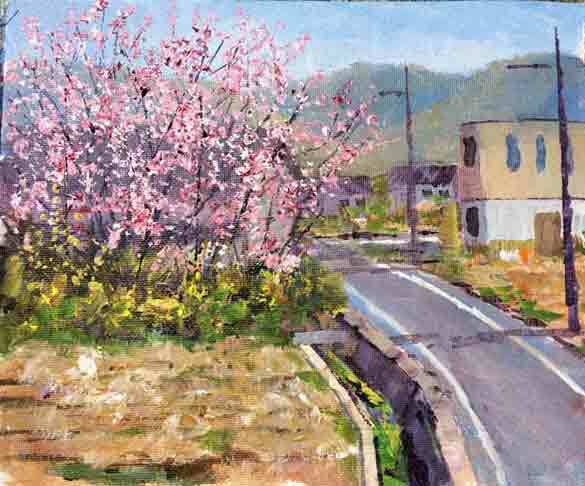 I have visited him several times, and cannot get enough of the Japanese countryside. Yes, of course the cities are where most visitors go and great fun, but after awhile, to me, the big cities start to blend into the same. Well, this blog entry is not about Thanksgiving day, but about one day at a school where Justin teaches…a day I will never forget. Justin rotates around a half dozen schools teaching English from Kindergarten through grade school. The Kusakabe Elementary School principal was interested in meeting me, so I went with Justin in his car to the school for his teaching day. I wasn’t sure if I wanted to stay the entire day sitting around a Japanese school, and it was a little too far to walk home, so figured I was there for the day. After the first hour I didn’t want to leave! It was a drizzly cloudy day. As soon as we arrived, the principal was expecting me, and he and some teachers royally greeted me. 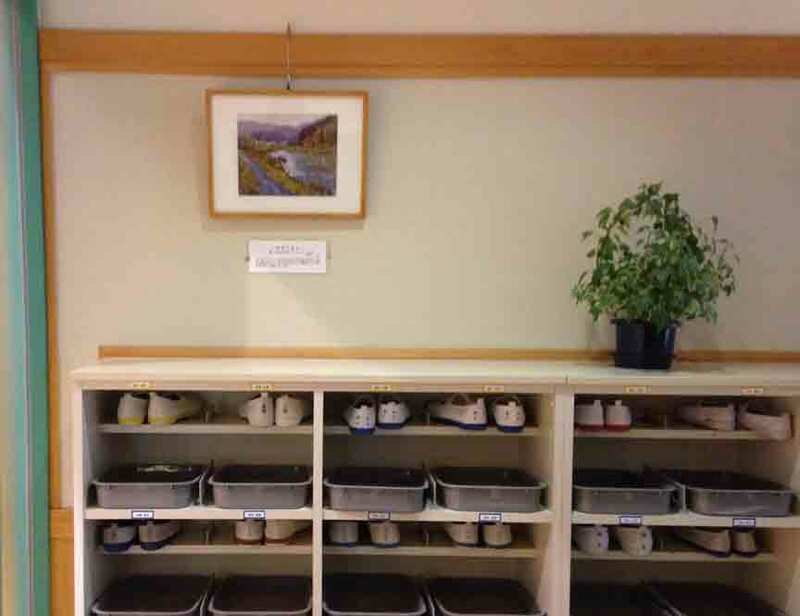 In Japanese schools, upon entering, you take your outside shoes off, and put your inside shoes on. They have slippers for visitors, so I ‘slipped’ into those, and followed the principal to his office. We sat down in some sofas in front of his desk, and chatted a bit, somewhat in English with Justin doing a little interpreting. A few teachers came to greet me, and before you know it, I had rice paper, ink, and a Japanese brush in front of me and everyone expecting a ‘masterpiece’. Whoa! Japanese art such as this simplifies everything into just a few strokes. I am so unfamiliar with this, I just brushed out what I had seen the day before, Kamba Falls…and it didn’t turn out well. The first class of the day Justin taught was pre-school. I have never seen such a lively bunch of precious little kids eager to learn. Justin taught a few words for the day…banana, ice cream cone (can’t remember all exactly)…he put them in a song, talked, continually interacted with the children, and invited me to to come up and draw pictures of the words he was teaching on the board. I was so impressed by one student confined to a walker, seemingly the happiest of all. I didn’t know his condition, maybe palsy, but all the other kids just constantly came over and embraced and loved him. Watching those kids with all their enthusiasm was one of the sweetest and lovely things I have seen in my life, and it made me realize why Justin loved to live and teach there. 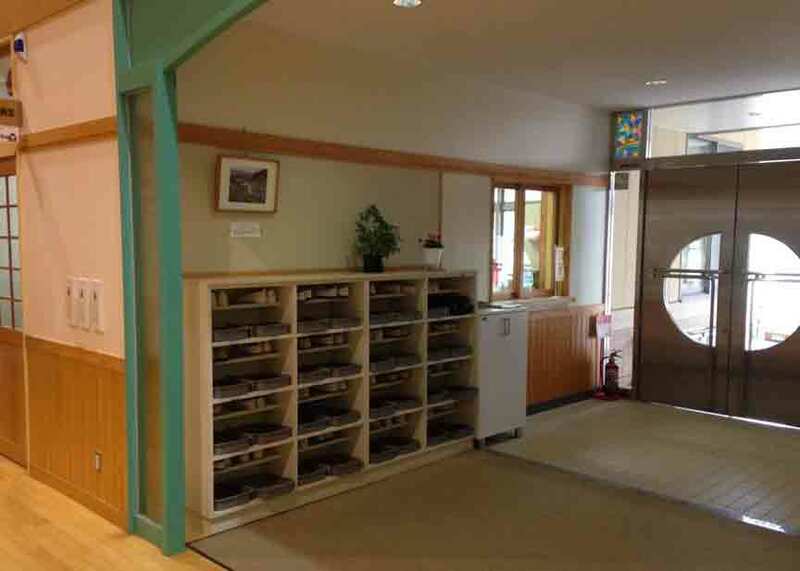 After that, I went to a number of other grade school classes with Justin, but after an introduction, and a little talk, I would exit the class. 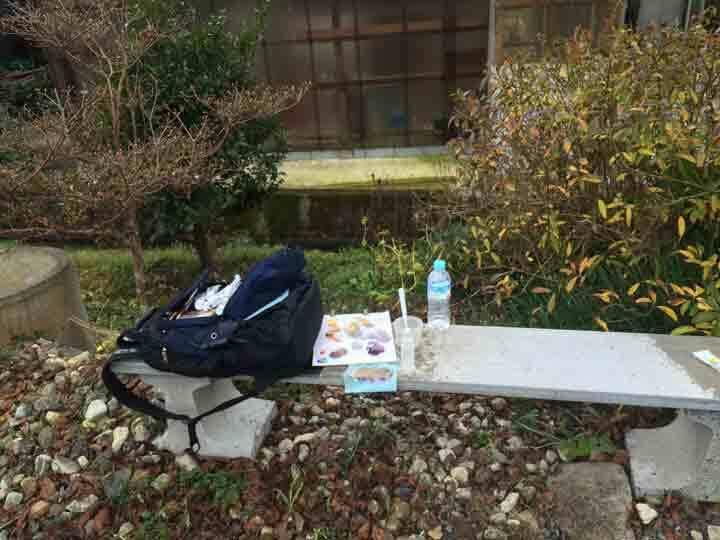 I wanted to go paint the Asahi River close to the school, so walked a few blocks with my acrylic travel kit, found a bench by the river, and started to paint. 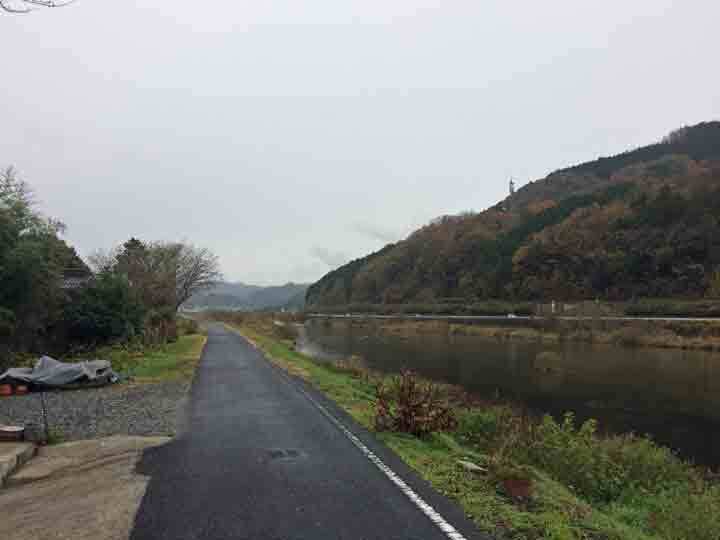 Like I said, it was an inclimate day, and it soon started to drizzle and found it impossible to continue. 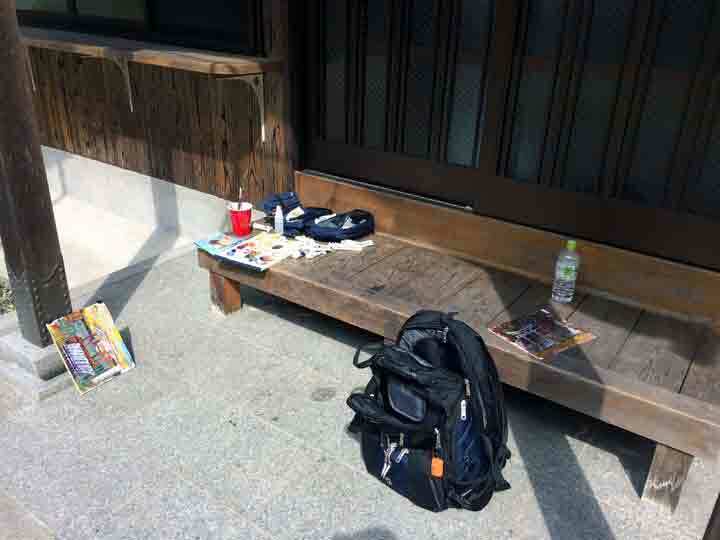 Heading back to the school, I asked them for a couple chairs to sit and finish the painting outside under the eves. Almost the entire time, I was surrounded by school kids asking me all kinds of questions in a few English words, using gestures, but mostly unable to communicate. I finished the painting under the eves of the school, and at the end of the day, presented it to the principal as a gift to the school. School was soon over, and all the school kids lined up to be dismissed to go home. The principal wanted me to stand with Justin as he spoke to the student body eager to go home. I had no idea what he said for about 10 minutes as he held that little 8×10 acrylic painting up over his head for all to see. Occasionally there were oohs, and aaahs from the kids, with everyone looking at me, and I just grinned and nodded not knowing at all what was being said. Art is a universal language which we all can see and appreciate, and even though Mr. Neff can’t speak our language, and we can’t speak much of his, Mr. Neff brought an expression which we all can relate, enjoy, share, and bring us together. I kinda like that principal! The school framed the painting, and it now hangs in the entrance by the shoe racks.